Many of the benefits from raising the wage, a move already undertaken by multiple governments around the country as well as some big-name companies, tend to go to higher-income families, said Neumark, who also pointed to research that shows raising wages kills jobs through higher costs to employers. Neumark is a professor of economics and director of the Center for Economics and Public Policy at the University of California, Irvine. 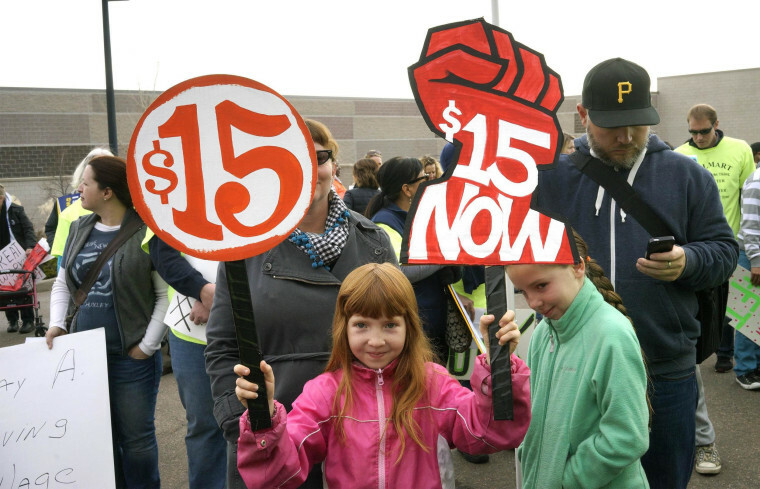 "Setting a higher minimum wage seems like a natural way to help lift families out of poverty. However, minimum wages target individual workers with low wages, rather than families with low incomes," he wrote. "Other policies that directly address low family income, such as the earned income tax credit, are more effective at reducing poverty." His conclusions drew a response from advocates for raising the wage who said the argument that boosting wages would cost jobs has been proven invalid and that an increase would help cut into poverty levels. "The mainstream view, as illustrated by meta-surveys of the whole minimum wage research field, is that the job loss effects of raising the minimum wage are very, very small," Paul Sohn, general counsel for the National Employment Law Project, said in an email to CNBC.com. An NELP study "shows that the bulk of rigorous minimum wage studies show instead that raising the minimum wage boosts incomes for low-wage workers with only very small adverse impacts on employment." The U.S. poverty rate has been fairly flat in recent years but actually was 2.3 percent higher at the end of 2014 than it was before the Great Recession in 2008, according to the Census Bureau. Advocates for the poor believe raising the minimum wage is a linchpin in helping to eradicate poverty, and 29 states plus the District of Columbia have minimums above the national floor of $7.25. Fighting poverty, though, is more complicated than raising wages. Demographically, about half of the 3 million or so workers receiving the minimum are 16 to 24 years old, with the highest concentration in the leisure and hospitality industry, according to the Bureau of Labor Statistics. Moreover, the percentage of workers at or below the minimum is on the decline, falling to 3.9 percent in 2014 from the most recent high of 6 percent in 2010. Neumark also points out that many of those receiving the wage aren't poor — there are no workers in 57 percent of families below the poverty line, while 46 percent of poor workers are getting paid more than $10.10 an hour, and 36 percent are making more than $12 an hour, he said. "Mandating higher wages for low-wage workers does not necessarily do a good job of delivering benefits to poor families," Neumark wrote. "Simple calculations suggest that a sizable share of the benefits from raising the minimum wage would not go to poor families." Increasing the earned income tax credit is a more effective way to fight poverty, he said. A family of four can get a credit of up to $5,548, which Neumark said is more tailored toward low-income families than hikes in the minimum wage. "The earned income tax credit targets low-income families much better, increases employment and reduces poverty, and for all these reasons seems far more effective," he wrote. "Policymakers are likely to do a better job fighting poverty by making the EITC more generous than by raising the minimum wage. Furthermore, using both of these policies together is more effective than minimum wage increases in isolation."